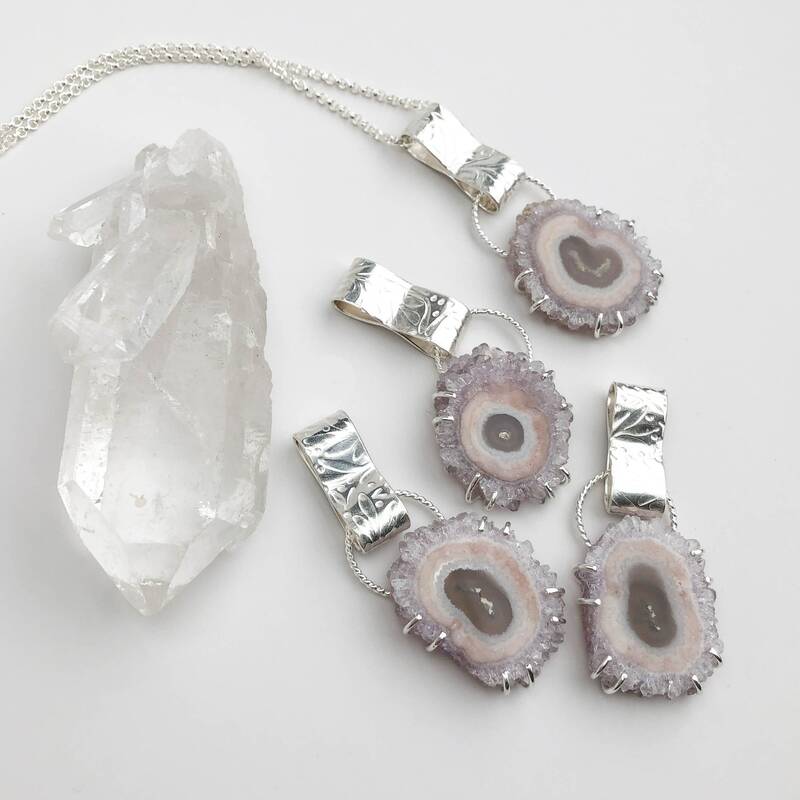 * Handmade with a natural amethyst stalactite slice and solid sterling silver. 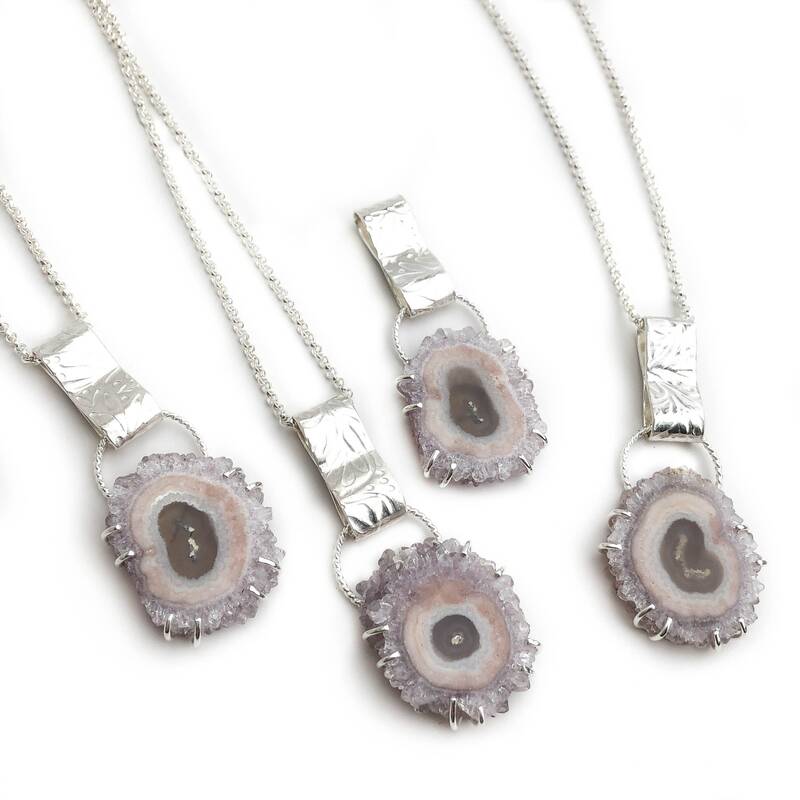 This unique pendant was created with a cross section slice of an amethyst stalactite and solid sterling silver. 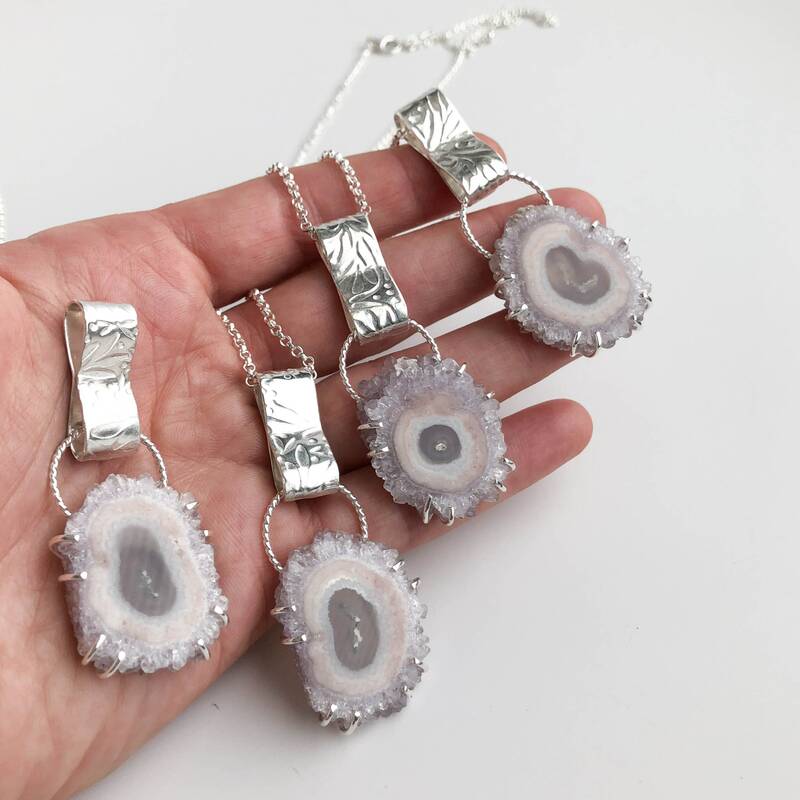 The slices are a beautiful look inside of a stalactite formation, the inner rings are the agate stones grown over time that give way to the glittery amethyst crystals on the outer rim. 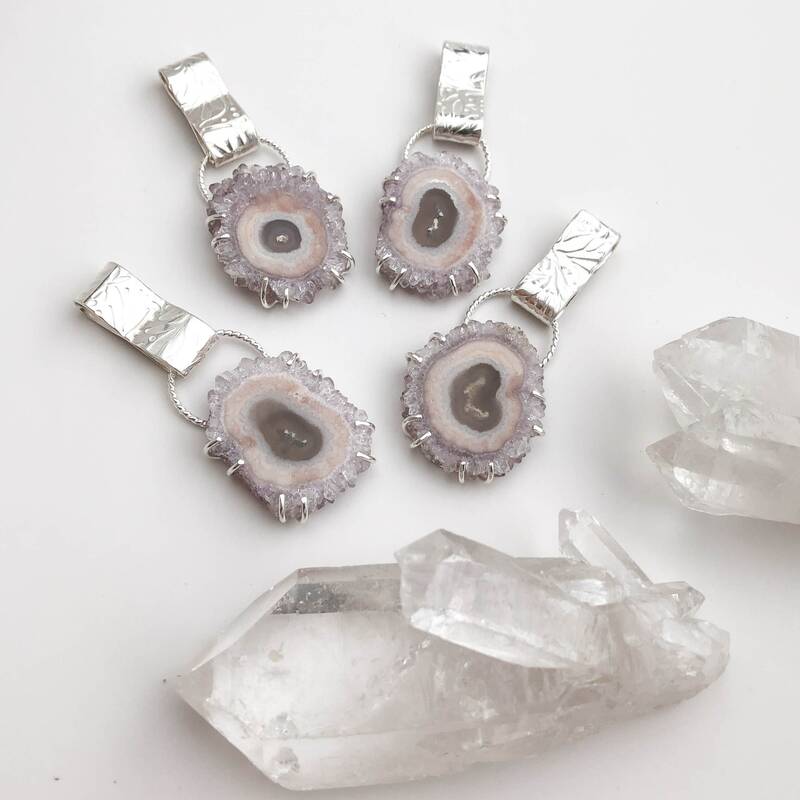 Both sides of the slice are polished and showcase the beautiful translucent and soft colors of the stone. 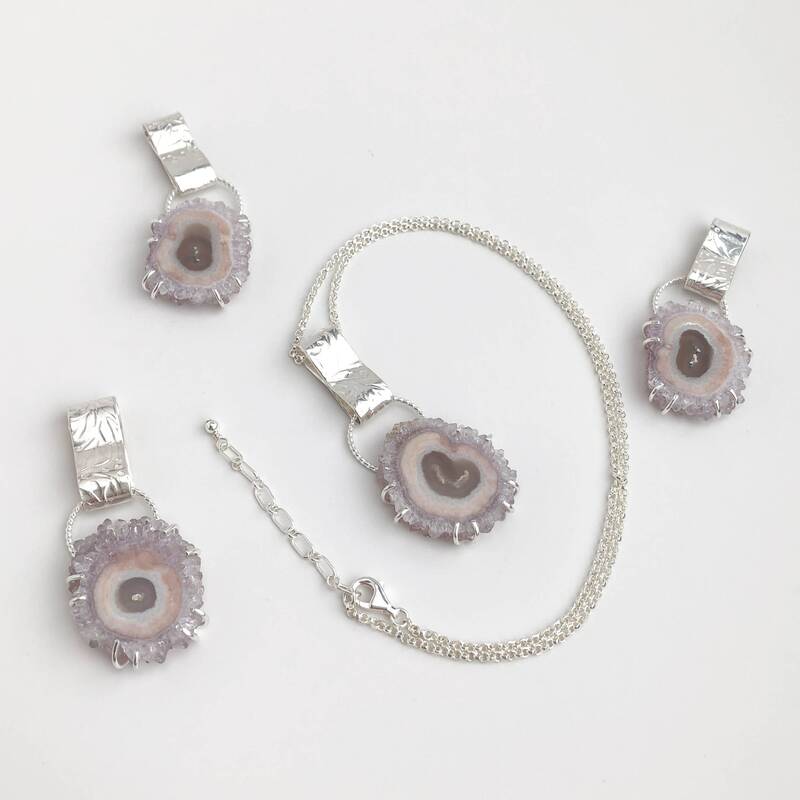 Each stone is a one of a kind formation and no two will be exactly the same. 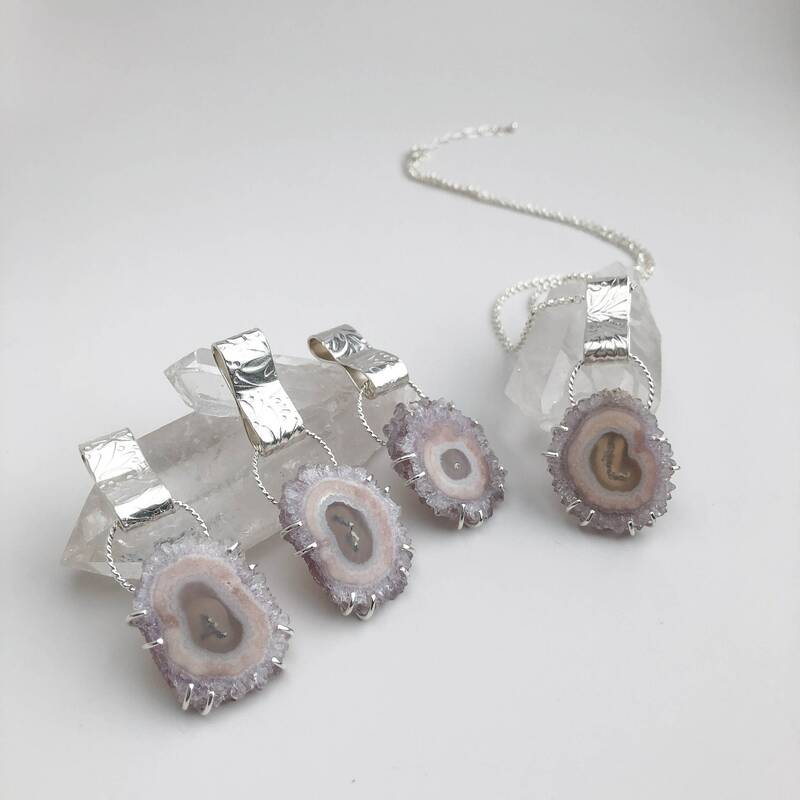 There are 4 pendants available as shown. 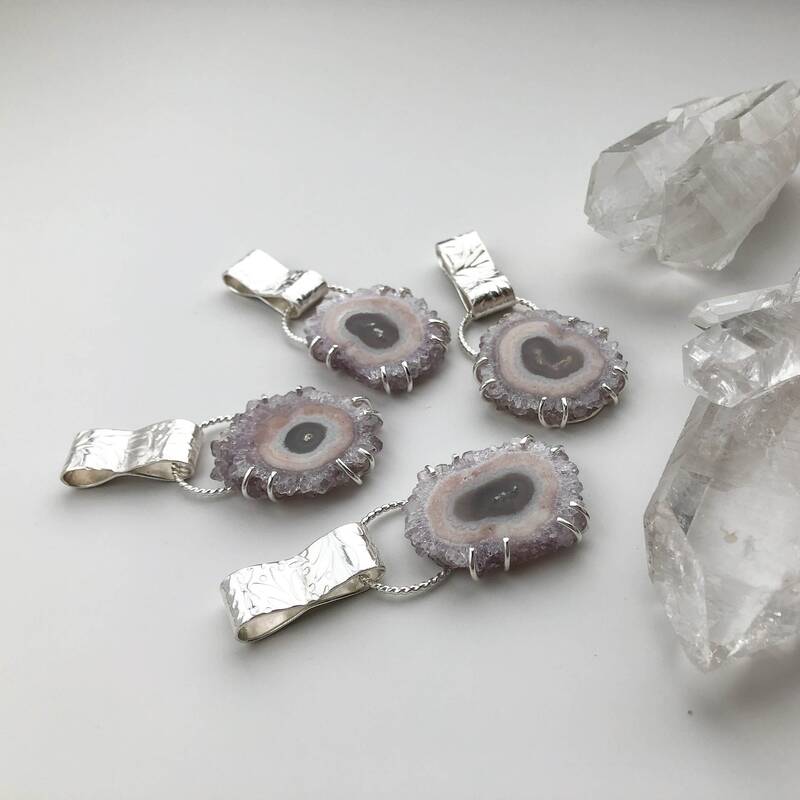 I created simple but secure prong settings for these gorgeous stones to allow the raw and organic shape of these crystals to shine. 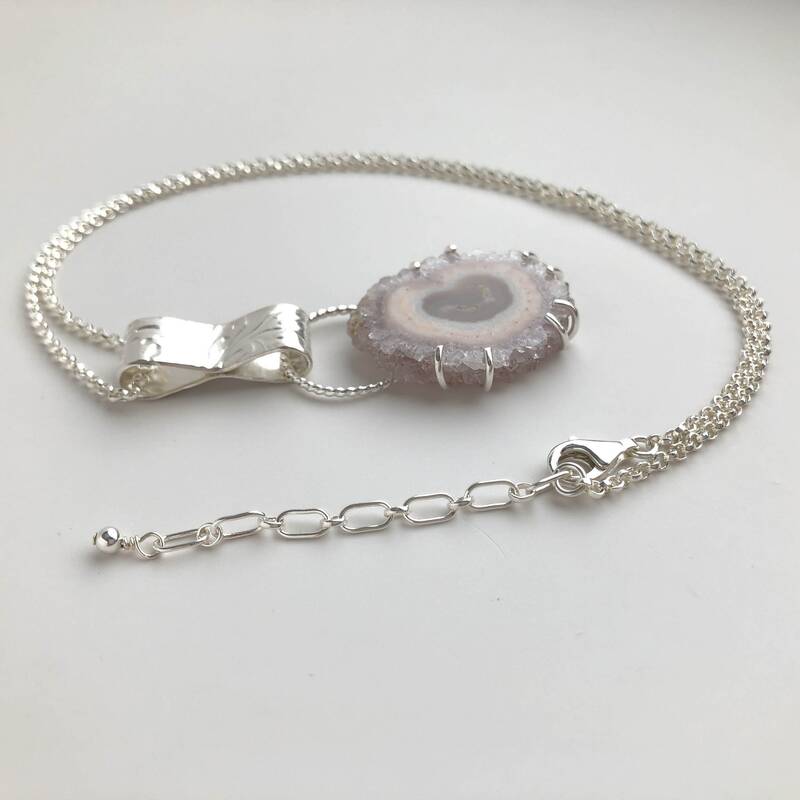 The bail I used features a hand embossed heavy sterling silver link that allows you to wear this with a variety of chains and at different lengths. 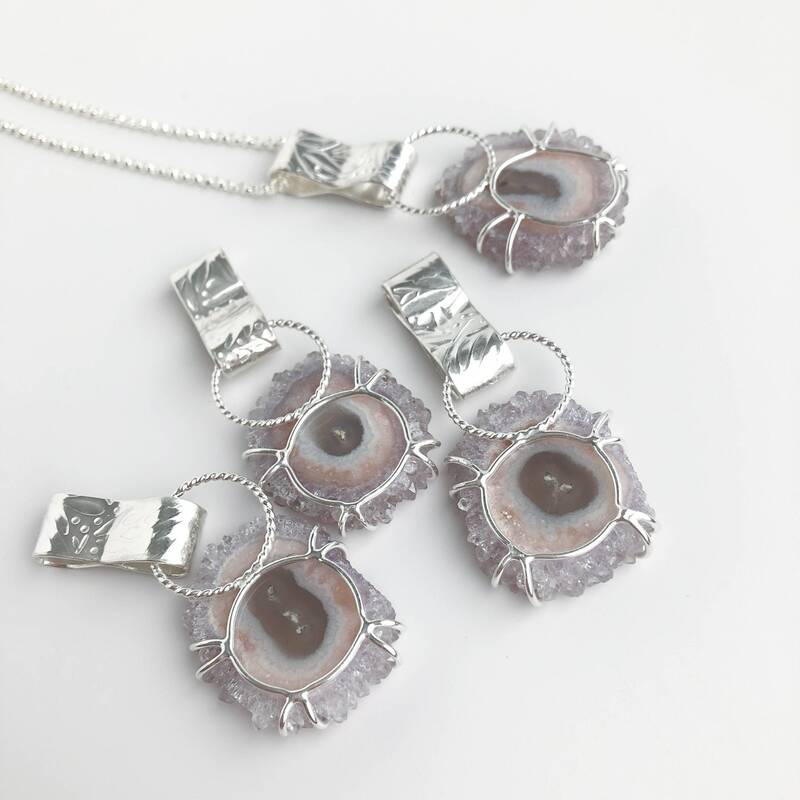 This can be sold without a chain as the bail is large enough to accommodate any chain ends up to 5mm. We do offer this with a chain as well and it will come off the chain that it comes with. 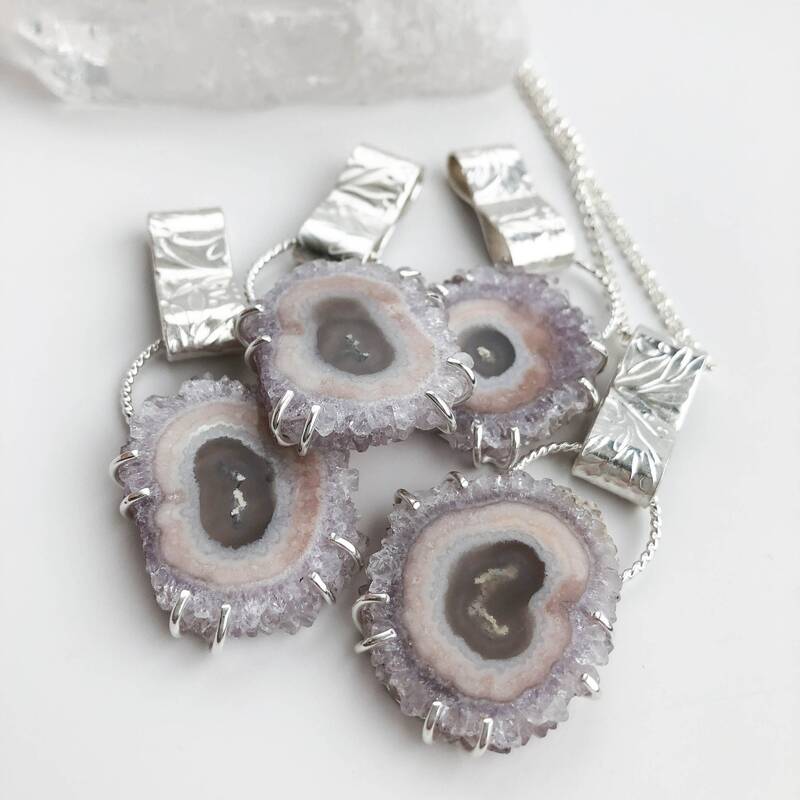 The chain we are offering with this is our medium weight sterling silver cable chain that is perfect for daily wear and sturdy enough for this unique pendant. All chains will have a lobster claw clasp and built in 2" extender chain making them adjustable. If you have a specific chain length in mind that is not listed above just contact us and we can create something custom for you.